On May 28th, I got the chance to participate in something big. How big? Well, so big it brought in almost a thousand people and took the entire Canalside in downtown Buffalo which has to be pretty big. So why all the hub bub? Simple. 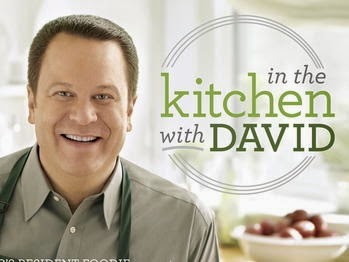 A live taping of In The Kitchen With David. For those unaware, In The Kitchen With David stars the mega popular, food lover, David Venable, a happy and upbeat Southern food connoisseur who loves food so much he breaks out into Happy Dances. Yes. I said Happy Dances. David is known to bust one or two out as he enjoys his favorite foods, usually mac and cheese or chocolate while accompanying it with a goofy facial reaction that would normally be reserved for a cartoon character or a very skilled stage performer. To some degree, I tend to think David was born to be the greatest entertainer-salesman hybrid ever. 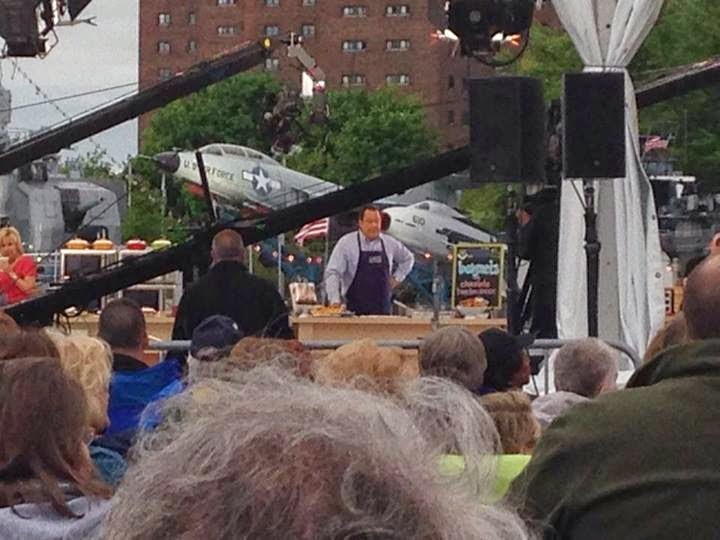 Accompanied by his on screen sidekick, Mary, David and QVC set up shop and filmed a live show in downtown Buffalo. To my knowledge, this is QVC's first live show that doesn't involve the safety net of a television studio. A lot could've gone wrong on live television. Weather, act of God, nWo invasion, anything. Weather up here in Western New York is more unreliable than your 45 year old cousin that lives in your mom's basement because he's still trying to make his music career come together. But thankfully, the weather conditions decided to play nice and let us "Foodies"(David's loving term for his audience) have our fun for two hours. With the exception of a stagehand coming into frame too soon, nothing went wrong. 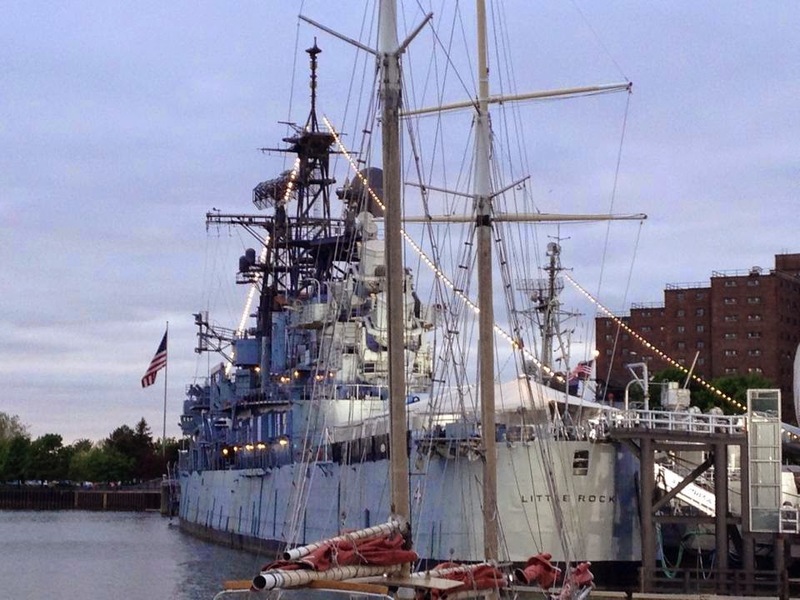 One of the many ships in the downtown harbor. My lady and I live in Rochester, just an hour and a half away from Buffalo. I normally get home around 6:30. With show time starting at 8, you can see my dilemma. Thankfully, I got off work early, raced home in record time and we were up in Buffalo by about 7:45. We were able to find great seats on the lawn which also amazed me. We also arrived just in time to see David warming up the crowd by signing autographs and taking a few photos. We attempted to grab him for a photo, but we couldn't get him in time before he started getting ready to go on air. So, after taking our seats, we watched as David started taking his cues from his producer and before we knew it, it was show time! David started his monologue about Buffalo, food and other fun things. Also, guess who made it on air during the intro? Yup. Ok, so it's a tiny frame, but we made it on air. Pretty cool huh? 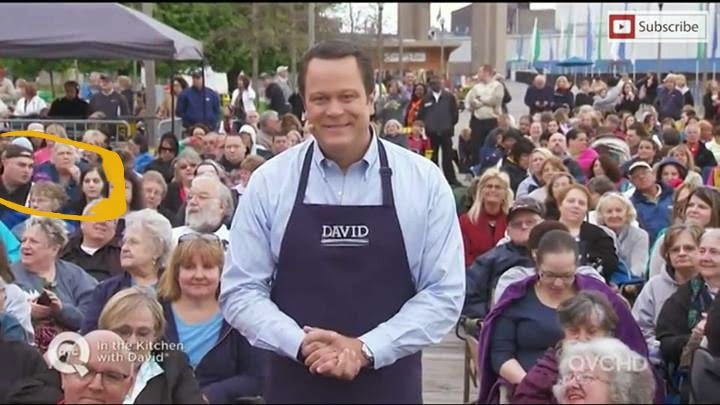 Anyway, after the show started, David started shilling familiar wares and QVC favorites including Lock n Lock containers, slow cookers, hot dogs and other great items. It didn't take long, however, for David to break out a Happy Dance. And go figure, I missed it. Ever hear stories about people who go to Nascar races and miss the first crash because they went to the bathroom? Nuff said. The bathrooms were about a quarter of a mile away from the show area and as soon as I open the door to the bathroom, what do I hear but the loudest yell of "HAPPY DANCE HAPPY DANCE!!!". Of course he would pull out a happy dance in the first 30 minutes. This is a total rookie mistake for those of us who watch David. You can imagine my disappointment. I returned to my seat and continued to hope for more entertainment.Happy Dances would follow later and made up for my goofup. So as the show continued, we'd see many of the familiar faces that normally play in the popularity of the show every week. The production of the show fascinated me as well. To see the amount of stagehands and crew put out to make it work at a hurried pace. If David had to walk over to another side of the stage, the crew would hurry like they were being held up at gunpoint. And everybody busted their butts to make sure the show ran smoothly. Mary, his social media correspondent and roving reporter moved through the crowd for "Taste-A-Monials" and listening to stories of the local cuisine. Mary definitely added a great fan interaction aspect for the show and was a delight. Sadly, every show has to come to an end. At 10, David signed off and came down to meet fans, Mary in tow. David seemed to relish meeting his fans and talking about their favorite moments of the show. Mary, held court with fans discussing the production, which was quite amazing to witness. My girlfriend and I were lucky enough to score a quick photo with David and left shortly afterwards. 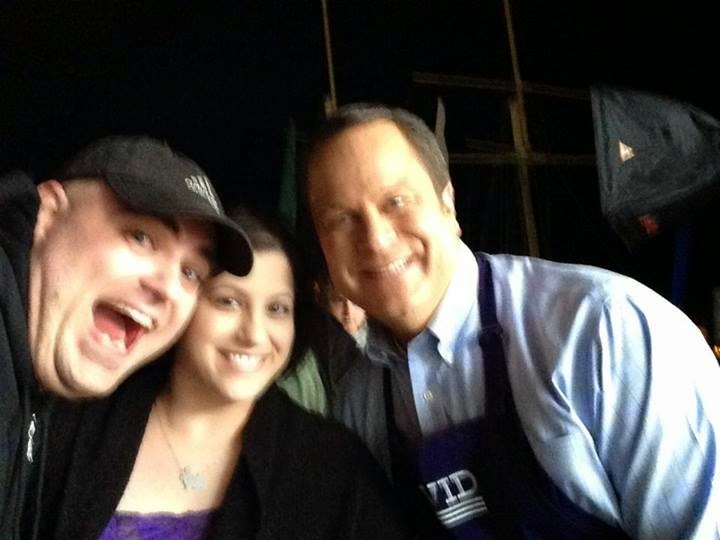 A tad bit blurry and it looks like I have a silly putty chin, but the pic is still a good one! In The Kitchen With David remains a weekly tradition of me and my girlfriend Laurie. And after watching the amazing production, hard work of all the staff and stagehands, and the amazing entertainment of David, we will continue to welcome David in our house every week. If David and QVC stops by your town, attend the taping. David is probably the last great entertainer and entertainer of our time and spreads the joy of eating and positivity wherever he goes. QVC has been doing live shows around the country for more than decade. So it's not too out of their comfort zone. Oh thank you for the correction! I'm kinda new to watching QVC, and my only reasoning is David anyhow, but I could've sworn I heard Mary telling fans this was their first show on the road, but I may have come into her conversation way too late. But thank you for the correction!